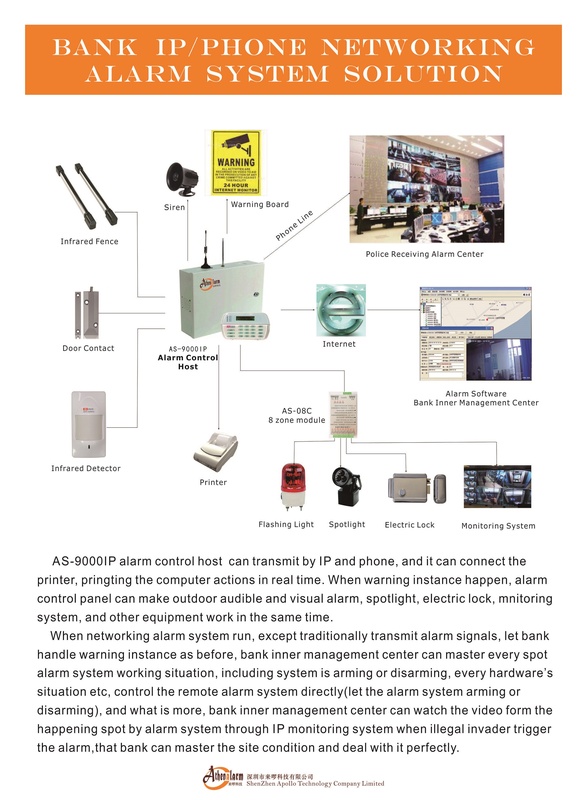 AS-9000IP Alarm control host can transmit by IP and phone, and it can connect the printer, pringting the computer actions in real time. When warning instance happen, alarm control panel can make outdoor audible and visual alarm, spotlight, electric lock, monitoring system, and other equipment work in the same time. When networking alarm system run, except traditionally transmit alarm signals, let bank handle warning instance as befor, bank inner management center can master every spot alarm system working situation, including system is arming or disarming,every hardware’s situation etc, control the remote alarm system directly (let the alarm system arming or disarming), and what is more, bank inner management center can watch the video form the happening spot by alarm system through IP monitoring system when illegal invader trigger the alarm, that bank can master the site condition and deal with it perfectly. Copyright © Shenzhen Apollo Technology Co., Ltd & Lenolink Telecommunication Co., Ltd. All Rights Reserved.